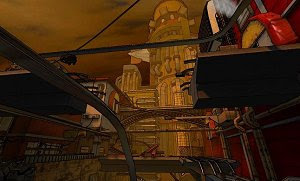 While Electronic Arts still teases us about a sequel to Mirror’s Edge, a team of Spanish students from the Universitat Pompeu Fabra developed Purge, a free game with a successful cel-shaded steampunk atmosphere, not unlike the one seen in Borderlands. The player’s goal is solely to survive, escaping guards that are hunting him based on the assumption that he’s a terrorist. That isn’t true, naturally, since the city is completely corrupt and Jack, the main protagonist, has to climb all the way up to the towering industrial complex that can be seen in the distance. The complex world can be navigated pretty much in the same way as the stunning Faith did in Mirror’s Edge, climbing, studying the guards’ routines using glass shards, escaping through air ducts, wall-running and jumping long distances. Technically Purge is a real delight, with an alluring aesthetic and some great controls. Besides using the keyboard and mouse, players may also opt for a Xbox 360 controller. Purge won’t take long to finish but that can also be considered as a high point, since players will leave it with a smile and memories of a good time jumping and running.